This voluptuous coming-of-age gay romance transports us not only to northern Italy, but to a lazy summer's exchange of books, fruit, glances and power. Italian writer-director Luca Guadagnino likes to show off his homeland as a place of sensual self-discovery. That's especially true of his last two fiction features, the exquisite Milanese romance I Am Love (2009)—a film with the power to make you pack your bags and head off to the nearest airport—and the languorous island thriller A Bigger Splash (2015). 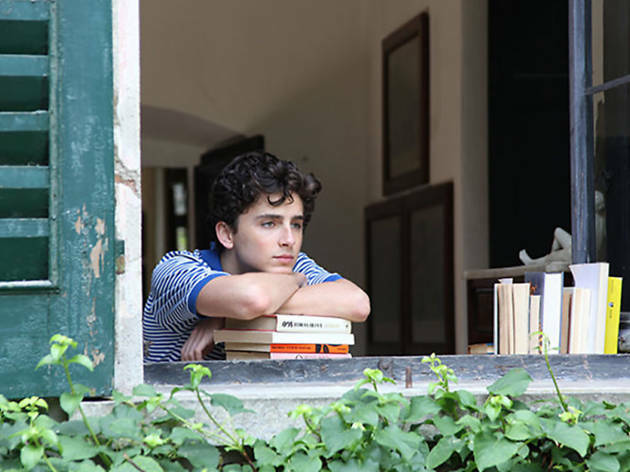 But he’s never mounted the total swirl of sultry weather, budding libidos and teenage confusion that marks his new drama, Call Me by Your Name, a triumphant, heartbreaking tale of coming out based on André Aciman’s acclaimed 2007 novel. When considered within the tradition of onscreen gay courtship, the movie takes its immediate place alongside such all-time greats as Brokeback Mountain, Carol and the recent Moonlight. When viewed outside that esteemed lineage, Call Me by Your Name has a choking emotional intensity that will be apparent to anyone who’s ever dared to reach out to another. The movie takes place “somewhere in northern Italy,” but it’s actually set at the peak of Western civilization—which, in case you didn’t know it, was the summer of 1983. In the breezy villa of a beloved American professor of antiquities (Michael Stuhlbarg), multiple languages are spoken by a loving family. Plates of food are passed around along with side dishes of intellectual debate and affectionate teasing. Girls in sundresses pedal to the lake on bicycles. A brilliant pop song, the Psychedelic Furs’ “Love My Way,” throbs out of radios and on the dance floor. And brainy discussions of art history compete for time with more tangible pleasures (not just volleyball). Swanning through this charmed universe like a little prince is thoughtful 17-year-old Elio (Timothée Chalamet, straddling the awkward age deftly), a musical prodigy who's often plugged into his Walkman, from which he transcribes piano etudes. (Guadagnino deploys the period details tactfully, always advancing the teen’s evolving mental state.) Elio has experienced these leisurely summers at the villa many times before, we gather, yet this time he is dumbstruck by the magnetism of Oliver (Armie Hammer), the chiseled, showboating grad student in tiny shorts flown out by his father for a season of research. Both young men share a Jewish heritage—Oliver wears a Star of David around his neck, while Elio’s family, he offers, are “Jews of discretion” per his mother—and both share a bathroom that begins to feels like a barrier. Guadagnino makes films for adults. It’s partly why his work feels so vital in a moviescape filled with immaturity, and even as he turns up the heat on his central characters’ subtle—and mutual—flirtation, he never descends into ponderousness or straight-up comedy. The pressure gets released in a spectacular one-take seduction in a dusty plaza, the camera circling as Elio, uncertain of his purpose, his urges, his entire body, musters up his courage and Oliver struts just out of reach. Call Me by Your Name is a playful film, but it trembles with a sense of impermanence, gorgeously developed as the summer’s shadows grow longer (cinematographer Sayombhu Mukdeeprom blesses the imagery with an atmosphere you can breathe) and the duo becomes more brazen with its affections. That’s as good a taste as one should offer, and probably best left there. But Guadagnino has a breadth of feeling worth mapping out at the edges: Bearded and gentle, Stuhlbarg nails a compassionate paternal monologue that uncorks the movie’s entire reservoir of empathy in a single speech. (To have such dads in the world.) Meanwhile, an attic tryst between two shirtless men and a ripe peach will leave your crowd gasping. Those are two dramatic extremes that few directors would know what to do with, much less attempt. Guadagnino, though, like his countrymate and one-time documentary subject Bernardo Bertolucci, is up to the task. In attaching sinuous style and casual sexiness to a universal ache, Guadagnino has come away with real wisdom. Sweet and salty, his movie burns like a suntan. I read the book: a marvellously told love affair. What a sweet story of first love and romance! This is such a beautiful film that will transport you to a beautiful little Italian village for you to watch the blossoming love between Oliver and Elio. I think this one will remind everyone of their first innocent experiences of love and relationships. Sadly mine wasn’t a beautiful, warm and heartfelt as this one but such is the joys of cinema. This is perfect film for a cold, wet London day when you want to be transported to sunny Italy and feel all warm and fuzzy inside. Not your typical boring Hollywood romance, I would highly recommend it for a cinematic adventure.